Caffeic acid phenethyl ester (CAPE) is an active component of propolis that exhibits cardioprotective and antiarrhythmic effects. The detailed mechanisms underlying these effects, however, are not entirely understood. The aim of this study was to elucidate the electromechanical effects of CAPE in guinea-pig cardiac preparations. Intracardiac electrograms, left ventricular (LV) pressure, and the anti-arrhythmic efficacy were determined using isolated hearts. Action potentials of papillary muscles were assessed with microelectrodes, Ca(2+) transients were measured by fluorescence, and ion fluxes were measured by patch-clamp techniques. 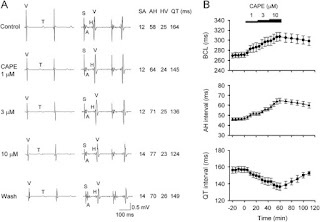 In a perfused heart model, CAPE prolonged the atrio-ventricular conduction interval, the Wenckebach cycle length, and the refractory periods of the AV node and His-Purkinje system, while shortening the QT interval. CAPE reduced the occurrence of reperfusion-induced ventricular fibrillation and decreased LV pressure in isolated hearts. In papillary muscles, CAPE shortened the action potential duration and reduced both the maximum upstroke velocity and contractile force. In fura-2-loaded single ventricular myocytes, CAPE decreased cell shortening and the Ca(2+) transient amplitude. Patch-clamp experiments revealed that CAPE produced a use-dependent decrease in L-type Ca(2+) current (I(Ca,L)) (IC(50)=1.1μM) and Na(+) current (I(Na)) (IC(50)=0.43μM), caused a negative-shift of the voltage-dependent inactivation and a delay of recovery from inactivation. CAPE decreased the delayed outward K(+) current (I(K)) slightly, without affecting the inward rectifier K(+) current (I(K1)). These results suggest that the preferential inhibition of Ca(2+) inward and Na(+) inward currents by CAPE may induce major electromechanical alterations in guinea-pig cardiac preparations, which may underlie its antiarrhythmic action.